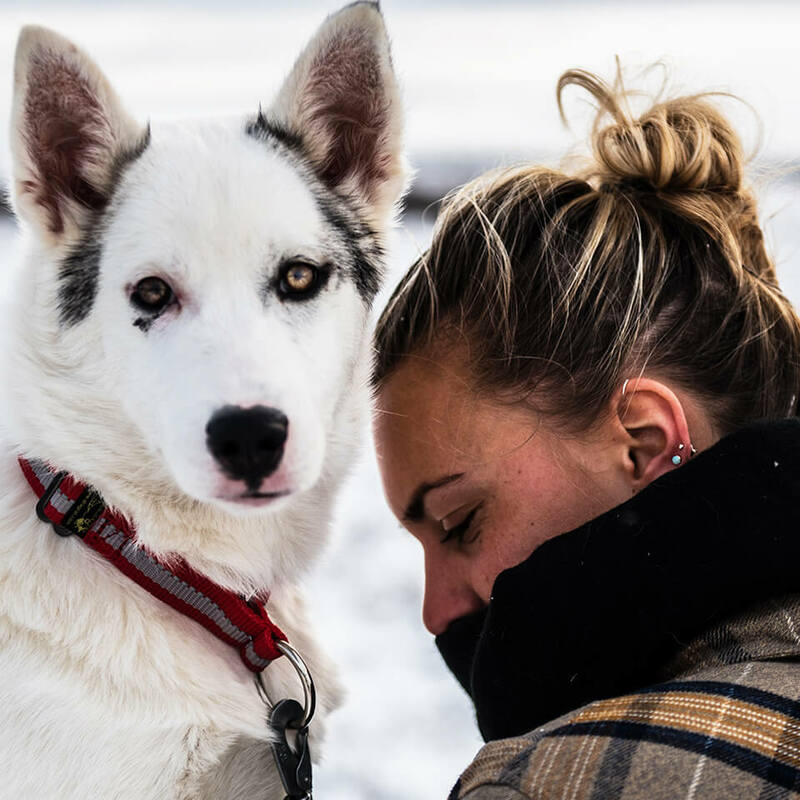 In Sälen you can rent a dog on your holiday. During the winter these dogs are hardworking huskies, but don’t worry! These dogs our well trained on a leash and will fill your walks with play and a lot of laughs. All necessary dog food and equipment is included and you can of course decide on how many days you want your companion. Our dogs love playing, exercise and affection – give your vacation some more of that! WHAT KIND OF BREED CAN WE EXPECT? The dogs that we rent are Siberian and Alaskan huskys. The two breeds of polardogs are used during the winter for dogsledding. ARE THE DOGS ALSO FRIENDLY TOWARDS CHILDREN? We rent out dogs to guests of all ages. We make sure that each dog is thoroughly tested and is “child-proof”. Needless to say, they are still dogs and need to be handled with outmost care and respect. But YES, the dogs love our guests. CAN OUR CHILDREN HANDLE THE DOG IN A LEASH? Our dogs are friendly and used to walk on a leash however we recommend that you are eight years or older to walk the dog. CAN THE DOG RUN WITHOUT A LEASH? No, the mountains care for a rich wildlife of birds and other animals which can be disturbed by our dogs. There is also a risk that the dogs run away for some shenanigans elsewhere. CAN WE LET THE DOG MEET WITH OTHER DOGS? All dogs have a language that can be hidden to the untrained eye. For both the dogs safety, please avoid the meeting! WE WOULD LIKE TO TAKE THE DOG TO NORWAY, IS THAT POSSIBLE? There are a lot of restrictions if you want to take the dog across the border. If you want to take the dog to Norway, please notify us at least 14 days in advance. There is also an additional cost of 550 SEK that you pay on delivery. CAN WE GIVE THE DOG TREATS? No. The dogs only gets food that it is used to. Too much different food is not healthy. You only need a leash which is given upon delivery. Food is also provided if you rent the dog for multiple days. Online payment by card, payment on delivery is with Swish or cash. WHERE AND WHEN DO WE PICKUP THE DOG? Please make your reservation at least a day in advance, online, by phone 0280 – 210 11 or mail, info@fjallaventyr.com. We also need some personal information (such as security number and home address), for our dogs safety. All necessary information and equipment is given to you on delivery. If you rent the dog for multiple days you are also provided with food. You sign a contract which also gives you some additional information. If you have any further inquiries, please send us an email on info@fjallaventyr.com. When do we return the dog? Talk to the handler on delivery otherwise you can call 070-304 14 45 to end the rental earlier. We expect the dog to be returned no later than 5 pm.